After graduating from SCAD about a year ago, I've dealt with the ups and downs of adjusting to the "Real World." Words can not express how difficult this time has been. On the inverse, I'm slowly learning how to extract the positives from the negatives. I could use this post to cry and complain about the struggle but what good would that do (plus I've already done that). I believe it's more important to share the issues I've faced and what I've learned from them. Just like every eager college graduate, I had my business cards printed, polished my resume, tweaked my cover letters, fine tuned my website and ironed my most flattering job interviewing outfit. I set my job sights REALLY high. I applied to all kinds of positions all over the country: character design and storyboarding , graphic design, internships and even fitness training positions. JOBS... JOBS... JOBS... With almost a year filled with, "Thank you for applying but we chose another candidate," depression, stress and anxiety began to rear their ugly heads. I've only been unhappy about a few things in my life but this post graduation adjustment hit me really hard. REALLY... REALLY hard. I remember feeling like I didn't deserve to do the things that made me happy. I convinced myself those things were a waste of time and I should be grinding ALL of time. It's important to note how hard it is to focus and stay motivated when you are submerged in depression, self-doubt, and uncertainty. On top of all of this, my personal and social life were suffering. So, you may ask, "Anthony, how did you get out of this?" If you are looking for a job, try your best to find a job that will get you closer to your overall goal. Yes, life can be hard and unpredictable. It can also be a teacher. Learning how to take lemons and make lemonade can be extremely difficult. But, when you take that first sip of the lemonade, the rest is just as sweet! Yep, sweet as the job offer I received from Lockton to be a Graphic Designer. I want to end on this note. I made a promise to myself. That promise is to use my visual storytelling skills to express myself. I have a few very interesting concepts I want to share with you guys. Be on the look out for my concept design and storyboards for my project titled: August 9, 2014. I hope this post finds it's way to those who need it most. A really good friend of mine, Dean Hodges, runs an awesome podcast called Comics4U. In the podcast, he interviews comic artist and gives them a platform to share their story. He interviewed me on his show and it is available today. In the podcast, we talk about the post graduation struggle along with how to get noticed in your career of choice. I have embedded the podcast in this post. Check it out! Thanks again Dean for giving me the opportunity to speak on your podcast! For the Free Print Giveaway information, click "AR 2 is on Twitch!" blog post underneath. AR 2 is on Twitch! In 3... 2... 1... I am proud to announce my channel on Twitch. Now that all of the technical aspects are all nailed down, I can finally make video content showcasing my art process. Last but not least, I will run a FREE GIVEAWAY PRINT session on RANDOM DAYS. If you are interested in earning a free AR 2 print, you will have to beat me in a First to 3 set in Street Fighter V. Simple enough, right? I have provided a screenshot of how the lobby should be created. If you win the First to 3 set, you've earned a free print! The print for each month have already been chosen. In the subject line, Write "First and Last Name and Gamertag/ Fighter ID won a free print"
All Free Prints will be mailed off during the week. For those who are interested in watching me digitally paint and would only like to spectate the matches, by all means, just stop by and enjoy the show. By clicking the Follow button on my Twitch channel, you will receive an email notification when I begin my stream. Donations and Subscriptions perks will be added shortly for those interested. For those looking to buy a print or reserve a spot on my commission list, I have a 10% off promo code just for you guys! It is : ar2live. Use this code at the checkout. This is my way of saying THANK YOU to all of my supporters! One of my favorite television series is Bar Rescue. During one of the episodes, I couldn't resist illustrating a quick sketch of Jon Taffer. 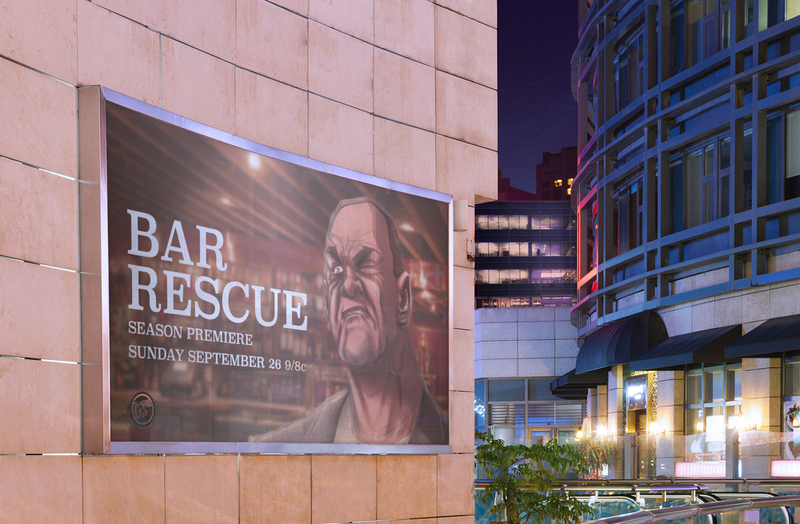 In the series, Jon Taffer and his team of experts rebrand struggling bar businesses. The reason why this show resonates with me so much is because of the rebranding aspect. I believe it is important to rebrand yourself when you are struggling with finding your voice. Recently, I've been creating new content for my portfolio strictly to exhibit my work ethic and creative range.